Coaxial patch cables are designed for use in microprobing applications. 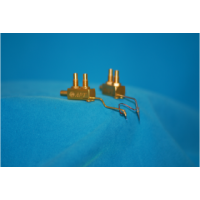 The CPC series is typically manufactured from RG174 series coaxial cable. The LPC series is a low noise RG178 coaxial cable. These cables are available with a variety of cable types, connector styles, and electrical configurations. If you don't see the cable and connector configuration you're looking for on this page, Contact APT for a Quote.